The Selfish Gene. Flamingo. (1976). ISBN 0-586-08316-2. The Selfish Gene. Oxford University Press. (1991). ISBN 0-19-286092-5. The Selfish Gene (30th anniversary ed.). Oxford University Press. (2006). ISBN 0-19-929115-2. The Extended Phenotype: The Long Reach of the Gene. Oxford University Press. (1982). ISBN 0-19-286088-7. The Blind Watchmaker: Why the Evidence of Evolution Reveals a Universe Without Design. Norton. (1986). ISBN 0-393-30448-5. River Out Of Eden: A Darwinian View of Life. Weidenfeld & Nicholson. (1995). ISBN 0-297-81540-7. Climbing Mount Improbable. Viking. (1996). ISBN 0-670-85018-7. Unweaving the Rainbow: Science, Delusion and the Appetite for Wonder. Allen Lane. (1998). ISBN 0-7139-9214-X. The Genetic Revolution and Human Rights: The Oxford Amnesty Lectures 1998. Oxford University Press. (1999). ISBN 0-19-286201-4. A Devil's Chaplain: Reflections on Hope, Lies, Science, and Love. Houghton Mifflin Harcourt. (2003). ISBN 0-618-33540-4. The Ancestor's Tale: A Pilgrimage to the Dawn of Life. Weidenfeld & Nicolson. (2004). ISBN 0-297-82503-8. The God Delusion. Houghton Mifflin Harcourt. (2006). ISBN 0-618-68000-4. The greatest show on earth: The Evidence for Evolution. Bantam Press. (2009). ISBN 0-593-06173-X. Magic of Reality: How We Know What's Really True. Bantam Press. (2011). ISBN 978-0-593-06612-6. ^ Dawkins, Richard (1969年). “A threshold model of choice behaviour”. Animal Behaviour 17 (1): 120. doi:10.1016/0003-3472(69)90120-1. ^ Dawkins, Richard (2006). The God Delusion. Transworld Publishers. pp. 169–172. ISBN 0-5930-5548-9. ^ Hamilton, W.D. (1964年). “The genetical evolution of social behaviour I and II”. Journal of Theoretical Biology 7: 1–16, 17–52. doi:10.1016/0022-5193(64)90038-4. ^ Trivers, Robert (1971年). “The evolution of reciprocal altruism”. Quarterly Review of Biology 46: 35–57. doi:10.1086/406755. ^ Dawkins, Richard (1979年). /Twelve%20Misunderstandings%20of%20Kin%20Selection.pdf “Twelve Misunderstandings of Kin Selection”. Zeitschrift fur Tierpsychologie 51: 184–200. http://www.simonyi.ox.ac.uk/dawkins/writings /Twelve%20Misunderstandings%20of%20Kin%20Selection.pdf. ^ Dover, Gabriel (2000). Dear Mr Darwin. London: Weidenfeld & Nicolson. ISBN 0-7538-1127-8. ^ より正確には「かなりの頻度で分離し、組み替えする物」 Williams, George C. (1966). Adaptation and Natural Selection. United States: Princeton University Press. ISBN 0-691-02615-7. ^ Mayr, Ernst (2000). What Evolution Is. Basic Books. ISBN 0-465-04426-3. ^ Midgley, Mary (2000). Science and Poetry. Routledge. ISBN 0-415-27632-2. ^ Brown, Andrew (1999). The Darwin Wars: How stupid genes became selfish genes. London: Simon and Schuster. ISBN 0-684-85144-X. ^ Morris, Richard (2001). The Evolutionists. W. H. Freeman. ISBN 071674094X. ^ Dennett, Daniel (1995). Darwin's Dangerous Idea. United States: Simon & Schuster. ISBN 0-684-80290-2. ^ リチャード・ドーキンス (2004 isbn=4-15-208557-6). 盲目の時計職人. pp. 134-189. ^ Dawkins, Richard (2003). A Devil's Chaplain. Houghton Mifflin. pp. 256. ISBN 0-618-33540-4. ^ Dawkins, Richard (2006). The God Delusion. Transworld Publishers. pp. 282-286. ISBN 0-5930-5548-9. ^ a b Dawkins, Richard (2006). The God Delusion. pp. 3. ISBN 0-618-68000-4. ^ Dawkins, Richard (1986). The Blind Watchmaker. Penguin Books. pp. xvi–xvii. ISBN 0-14-014481-1. ^ McGrath, Alister (2004). 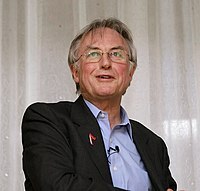 Dawkins' God: Genes, Memes, and the Meaning of Life. Oxford, England: Blackwell Publishing. pp. 81. ISBN 1-405-12538-1. ^ リチャード・ドーキンス (2007). 神は妄想である. pp. 104から重引. ISBN 4152088265. ^ Dawkins, Richard (2006). The God Delusion. pp. 50. ISBN 0-618-68000-4. ^ リチャード・ドーキンス (2007). 神は妄想である. pp. 88-89. ISBN 4152088265. ^ Dawkins, Richard (2006). The God Delusion. pp. 55–56. ISBN 0-618-68000-4. ^ Dawkins, Richard (1989). The Selfish Gene (2nd ed. ed.). United Kingdom: Oxford University Press. pp. 11. ISBN 0-19-286092-5. ^ Kelly, Kevin (1994). Out of Control: The New Biology of Machines, Social Systems, and the Economic World. United States: Addison-Wesley. pp. 360. ISBN 0-201-48340-8. ^ Blackmore, Susan (1999). The Meme Machine. Oxford University Press. ISBN 0-19-286212-X. ^ Dawkins, Richard (1998). Unweaving The Rainbow. United Kingdom: Penguin. pp. 4–7. ISBN 0-618-05673-4. ^ Diamond, John (2001). Snake Oil and Other Preoccupations. United Kingdom: Vintage. ISBN 0-099-42833-4. ^ Dawkins, Richard (2003). A Devil's Chaplain. United States: Houghton Mifflin. pp. 58. ISBN 0-618-33540-4. ^ Dawkins, Richard (1989). The Selfish Gene (2nd ed. ed.). United Kingdom: Oxford University Press. pp. 172-173. ISBN 0-19-286092-5. ^ The Great Ape Project. United Kingdom: Fourth Estate. (1993). ISBN 0-312-1181-8.